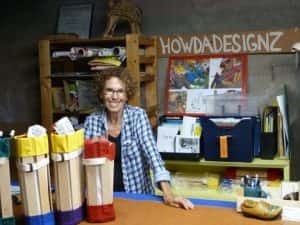 Thank you Boston Voyager for your interview with Howda Designz owner, Leslie Aisner Novak. The Boston Voyager website, on April 3, 2018, features the following article. For more information about Voyage Media click here. Today we’d like to introduce you to Leslie Aisner Novak. 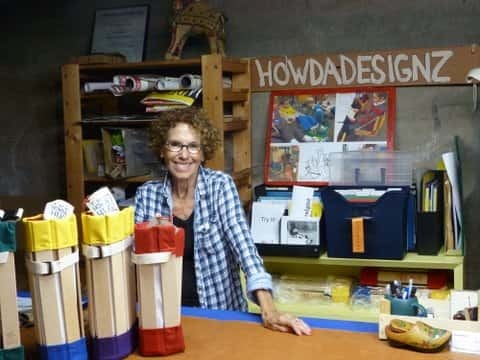 I founded Howda Designz in 1990 after reconstructing an old wood and canvas seat that I discovered tucked away in a box of discarded items. Upon further research and investigation of the seat, I learned that it was originally made in 1928 for rumble seats of the first motorcars and for bench seating under The Big Top. With guidance through the manufacturing process given me by a good friend, I spent two years re-constructing, product testing, and patenting the new/old seat using innovative construction methods to add durability and functionality to the original. My utility patent was granted based on this new construction method. The beauty of reconstructing this old seat is that while I saved an old-fashioned “technology” from extinction – and created a cottage business that became international in scope – I had created the HowdaSeat, a product that helped ease back and joint pain for people experiencing arthritis, sciatica and other issues. The first catalog to virtually launching the HowdaSeat nationwide was the J. Peterman Co. Catalog.The HowdaSeat was a fan favorite years and many of those seats are still in use today! Following the initial HowdaSeat success I was looking for other ways the HowdaSeat could make a difference. In January 2006, after months of stringent clinical trials, I introduced the patented HowdaHUG, a seat designed for children who require cradling and rocking to be more peaceful and calm. The HowdaHUG seat has now become a standard tool in thousands of classrooms across the U.S., Australia, and Canada. In November of 2017, Howda Designz was the recipient of the EDspaces Innovation Award in seating from the International Interior Design Association (IIDA). As founder and CEO, I hold patents to both the HowdaSeat and HowdaHUG and continue to oversee their manufacture and distribution. Both the HowdaSeat and HowdaHUG are handcrafted in Maine and sold online, in catalogs and other retail distributors. Of course, when it comes to obstacles and challenges there are the ones that most entrepreneurs encounter. I was a woman, trying to establish myself in a manufacturing industry, looking for a bank and financial backing, identifying suppliers, staff and dealing with overhead. Even with those challenges, the greatest obstacle I faced was getting over my own ‘brain’ and making the promise to myself to go forward with this idea, no matter what. Today Howda Designz supplies HowdaHUGS to schools and classrooms worldwide. I could not have predicted that the old, dusty wood and canvas seat would evolve into a tool that parents, teachers and therapists use and recommend for children ,with ADHD, Asperger’s Syndrome, Autism Spectrum Disorders, sensory processing disorders, Down syndrome, Reactive Attachment Disorder, low tone, specific learning disabilities, and Cerebral Palsy, among others. There’s also the challenge of hanging in when products get copied or ripped off. Some of the bags I designed and other products that I developed and patented were also copied. To keep the Howdaseat and the Howdahug safe from being produced in another country and taken from me required challenges in design, manufacture and constant changes to keep these products answering the needs of adults and children by improvements and listening to customers and one step ahead at all times. There’s not a day that a challenge does not present. There’s not a time when trust to keep going “no matter what” is not of the utmost importance. Alright – so let’s talk business. Tell us about Howda Designz – what should we know? HowdaHUG and HowdaSeats have always been made by hand here in the United States. Proudly made in Maine of eco-friendly and renewable materials. Being smart enough to know that I need to surround myself with people that are talented and smarter than I, that ‘Can do’. Do Your Classroom Seats Do This?